Many of the hotels in Miami charge a resort fee. This is an additional fee charged by your hotel for each night you stay there. Be sure to check if the hotel you are looking at includes it in the room rate. The price can vary from $8 to $25 a day and includes extras such as beach chairs and umbrellas, use of the gym and business center, beach towels and even bike rentals. Z Ocean charges $21 a day and another $14 on top of that if you would like to use their internet. With the resort fee only including towels, pool chairs and umbrellas, this hotel definitely falls into the category of ridiculously priced. Townhouse charges a resort fee of 13% of your room rate rather than a set price. This price can work out to be high depending on when you stay in Miami, but it does include much more than other hotels - breakfast, beach chairs, bicycle rental, internet and rooftop access are all included in the fee. Palms charges $14 a day to use their gym, pool chairs and towels, plus their internet. Breakfast is also included in the resort fee. Savoy charges $13 a day but does not include breakfast. It does give you a daily newspaper, free local calls, the usual beach chairs and towels, and internet. Betsy on Ocean Drive charges $15 a day. They offer beach chairs, towels and internet, plus fresh fruit in your room, use of the fitness center, and free yoga classes on the weekend. Soho Beach House has no resort fee but plenty of freebies. They boast a library, movie theater, two pools, and free internet. Loews is one of the biggest hotels on South Beach and does not have a resort fee, but charges for wifi (free in lobby), and depending on your reservation, it may include free use of the fitness center (otherwise, there is a $10 fee). There is no breakfast, but they do serve free coffee. Sagamore charges for their internet but there is no resort fee. They offer a pool, gym and spa, room service, and all their rooms are suites. Beacon has a business center, gym, internet, plus beach towels and chairs, all for free. Grand Beach includes use of their gym, beach towels and chairs, and depending on your reservation, it may also include free breakfast. Marriott South Beach offers free internet only in the lobby, but does have a business center, gym, and jacuzzi. One thing no hotel will include is free parking. South Beach is a small city and very walkable so you can easily opt to leave the car at home. However, if you do come to South Beach with a car, be prepared to pay to park it. Parking costs between $25-$35 a day, plus 13% travel sales tax. 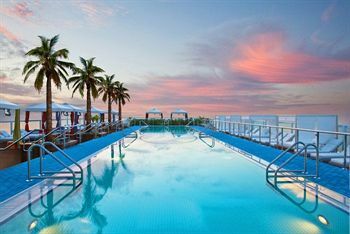 Miami Hotel Tip #2 - If your hotel does not have a pool, the Flamingo Park pool is a hidden gem. And there is also a sandy beach, just a few blocks away.